Children’s Country Day School Nature education is an important part of daily learning at Children’s Country Day School in Mendota Heights, MN. Adding a certified Nature Explore Classroom only seemed natural to the staff at Country Day. In the Nature Art Area, children create beautiful masterpieces with natural materials. Country Day’s mission over the past 40 years has been providing hands on nature experiences for young children. The 7 acre model farm provides the perfect opportunity for children to daily interact with a variety of farm animals and participate first hand in planting as well as caring for all aspects of nature. Located in the Twin Cities, Country Day’s Nature Explore Classroom encourages children to discover the wonders outside their own back door. At school, the children enjoy exploring many aspects of nature in the Maka Play at Country Day (Maka is the Dakota word for Earth). 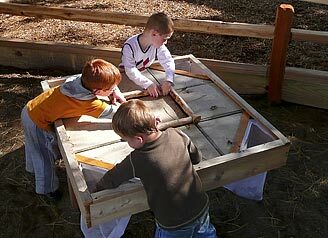 Children play in a messy materials area that has a Minnesota north woods theme, enjoy a natural art area nestled under mature red pine and spruce trees and explore the beauty and mysteries of nature throughout the classroom. 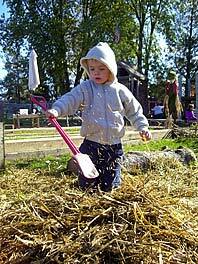 The Messy Materials Area has a Minnesota north woods theme where children can explore piles of hay and grasses. 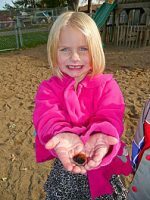 Children can make wonderful connections with nature by feeling a caterpillar crawl in their hand. Children enjoy playing instruments on stage in the Music and Movement Area.